The White House and leading lawmakers are dismissing a liberal Middle East policy group's escalating attacks on the U.S. ambassador to Israel, according to conversations with Trump administration officials and others who spoke to the Washington Free Beacon about the situation. J Street, a liberal advocacy group viewed as operating on the fringes of the Jewish community due to its harsh criticism of Israel, recently called for U.S. 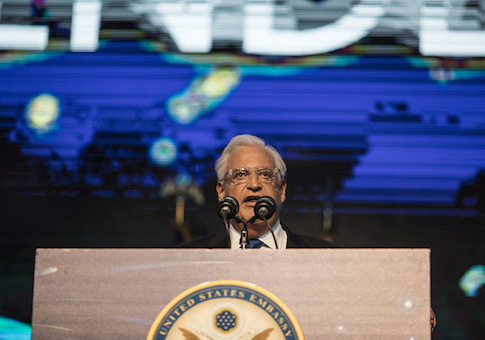 Ambassador to Israel David Friedman to be recalled from his post for promoting closer U.S.-Israel ties as he carries out President Donald Trump's policy priorities in the region, which included relocating the U.S. embassy in Israel from Tel Aviv to the country's capital city of Jerusalem. While Friedman has been hailed by Republicans for his work to repair the historically close U.S.-Israel relationship that had frayed during the Obama administration, J Street and its allies have been attacking the diplomat for recent comments stating, "There's no question Republicans support Israel more than Democrats." J Street has repeatedly been on the losing side of confrontations with the Trump administration. It's efforts to save the Iran nuclear deal, oppose Friedman's nomination, stop the U.S. embassy move to Jerusalem, torpedo the nomination of current Secretary of State Mike Pompeo, and numerous others, have all failed in recent months. J Street, which has long found itself isolated in the Jewish and foreign policy communities, is now calling for a Senate investigation into Friedman as part of what many insiders described to the Free Beacon as a smear campaign meant to undermine the ambassador and the Trump administration's increasing efforts to foster peace between the Israelis and Palestinians. The White House is standing firmly behind Friedman. A spokesperson for the White House National Security Council said that Friedman will continue to build increased ties between the America and Israel. "Ambassador Friedman is among those tasked by the President with strengthening the relations between the United States and Israel," the official told the Free Beacon. "He has done so effectively and diplomatically." J Street's attacks on Friedman also have received sharp criticism from American lawmakers and Israel's former ambassador to the United States under the Obama administration. Friedman "is doing a fantastic job and the attacks against him by the Soros-backed, anti-Israel group J Street are as misguided as they are predictable," Rep. Ron DeSantis (R., Fla.), a member of the House Foreign Affairs Committee, wrote on Twitter. "The US-Israel relationship is stronger than ever and David's strong diplomacy is a key reason why." Elliott Abrams, a foreign policy expert who served as a top official in both the Regan and Bush administrations, also dismissed attacks from J Street. "The J Street attacks on Amb. Friedman are shameful, hitting a new low even for J Street. No administration has called the Israeli settlements ‘illegal,' and the most common way the State Department has referred to them for decades is as ‘unhelpful' to the ‘peace process,'" said Abrams. "Amb. Friedman is committing what J Street thinks are crimes: he is celebrating the American-Israeli alliance, celebrating the current administration's strong support for Israel, and defending Israel strongly against unfair attacks. We are used to seeing our U.N. ambassadors do that—from Moynihan and Kirkpatrick to Bolton and Haley—but not to seeing our ambassador to Israel do it. J Street will not forgive him for all this, especially as he now does it from Jerusalem and not Tel Aviv, but the truth is he deserves commendation for this work." Friedman also received support from Michael Oren, an Israeli lawmaker who served as Israel's ambassador to the U.S. from 2009 to 2013. "J Street's problem is not with Amb. Friedman but with democracy," Oren wrote on Twitter. "It supported the previous ambassador who represented his president's policies on Israel but not the current one who does the same. J Street opposes the more pro-Israel policy and the will of the American people." Trump administration insiders who work on Israel issues have mocked J Street's campaign against Friedman behind closed doors. While the group calls on the Senate to recall him from his post, that legislative body has no power to carry out such an action. Only a president can recall his own ambassador. "What a bunch of clowns," said one senior U.S. official who works on regional issues. "J Street spent eight years driving a wedge between the United States and Israel. They said Republicans who supported Israel were warmongers and traitors. They said Democrats who attacked and endangered Israel actually had Israel's best interests at heart. Their conventions these days are like a who's-who of Israel haters from the Obama administration." "Adults don't take J Street seriously at all, and even the people who sign their petitions are mostly humoring them to make them go away," the source said. J Street promoted a series of misleading half-truths and outright lies in its public attacks on Friedman, including falsely accusing him of being involved with a designated terror organization. In its release, J Street alleges that Friedman, while the head of a pro-Israel group called Beit El Yeshiva Center, helped funnel "thousands of dollars to [a] right-wing extremist group named Komemiyut." While a group by that name is on the U.S. designated terrorist list, initial reports tying Friedman to the organization were later corrected to explain that there is another group called Komemiyut that is wholly separate and unaffiliated with the organization on the terror list. J Street additionally charged that Friedman is unilaterally altering longstanding U.S. policy of so-called settlement activity in Israel due to recent comments by him stating, "I don't believe the settlements are illegal." However, J Street confuses actual American government policy on settlements, particularly that of the Obama administration, which never stated that settlements are "illegal," but rather "illegitimate," a significant legal distinction. J Street further promotes the lie that no Democratic U.S. lawmakers were invited to the new U.S. embassy opening in Jerusalem. In fact, there was an open invitation to all lawmakers, but not a single Democrat accepted it. Noah Pollak, a Middle East expert, told the Free Beacon that J Street, long on the far left, has become unhinged since Trump took office. "J Street has always had a casual relationship with the truth, but the smears against Ambassador Friedman are breathtakingly dishonest even grading on the J Street curve," Pollak said. "Why have they become this crazy? The extent of their derangement is proportional to the extent of their failure. There is no longer a policy agenda, so any attack will suffice, the more emotionally satisfying the better." This entry was posted in Issues and tagged Israel, J Street. Bookmark the permalink.